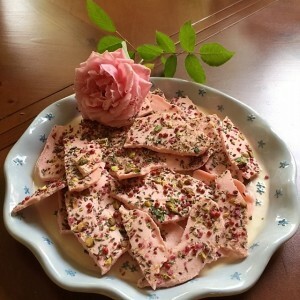 Last night I amazed myself by stirring up some homemade candy bark with flower essences. This was my first foray into concocting candy and a creative endeavor way beyond my comfort zone. Making candy with sugar soaked roses, culinary lavender and hibiscus crystals was an entirely new undertaking. Where the inspiration came from was a mystery until I recalled lounging with my Victoria magazine. Something about seeing a beautiful bounty of flowers in print spoke to me and my confection was born. Sometimes our passions are slipping past us in the subtlest of places. If give the chance, our hearts have the power to by-pass our minds just long enough to allow inspiration to enter. To be inspired is to be in spirit, then discover what’s in store for us. One of my favorite resting practices is to sit quietly as I leaf through a magazine. The on-line version of this diversion is Pinterest and yet I prefer the palpable enhancement of touching the text, turning pages with my fingertips, and the smell of glossy paper in the air. A chance to linger with the photo images in one’s lap possesses its own kind of magic. Our intuition glimpses a snapshot that in turn kindles a fire we may not have known was ready to burn. Serendipity takes hold in a flash and a surprise creation emerges. What inspiration has rest brought to your table?